My 100th recipe post is finally here! 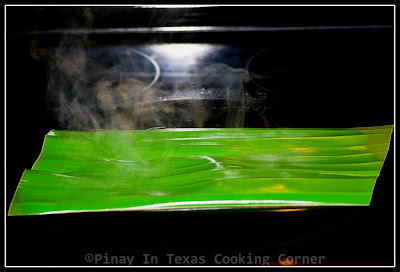 That's actually 99 more than I thought I could share when I started Pinay In Texas Cooking Corner! To celebrate this, and at the same time as a way of showing how much I appreciate all your support, I'm hosting my first GIVEAWAY!!! So after checking out this recipe, drop by my 100th RECIPE POST GIVEAWAY PAGE and find out what I have for you! It's open to everyone...US and non-US residents, so all of you have the chance to join! 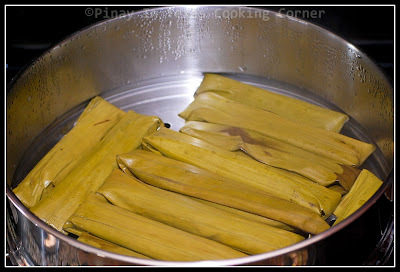 With all the leftover banana leaves from my Kamayan Dinner party for Foodbuzz 24x24 last week, I thought of making this popular snack in the Philippines. It's called Sumang Kamoteng Kahoy (Cassava Wrapped in Banana Leaves). 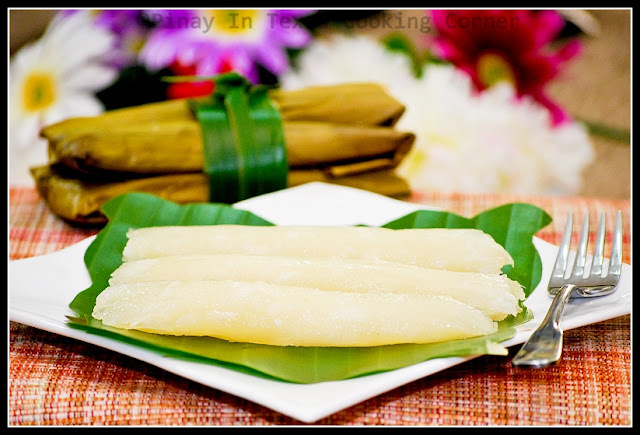 This is a variation of the more popular Sumang Malagkit which is steamed glutinous rice wrapped in banana leaves. Aside from the very simple process of making Sumang Kamoteng Kahoy, this "kakanin" (Filipino native sweet delicacy) is so popular to Filipinos because of the abundance of kamoteng kahoy in the Philippines. 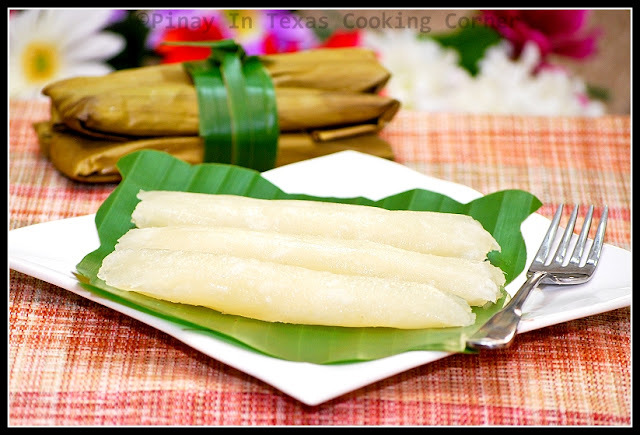 Also known as yucca, cassava or manioc, kamoteng kahoy is the third largest source of carbohydrates for meals in the world. Here in the US, you can buy it fresh or frozen. Though I prefer to buy it fresh whenever I find some at the Asian store, I always have the frozen one in the freezer for emergency use. It's my first time to make suman, so I decided to just use my remaining 1 pack of frozen cassava just so I could see the outcome. Ryan was so glad to find these suman waiting for him when he got home from work the other day. He said they're perfect! How I wish I had more cassava so I could have made more. It's gone in minutes! But I'm happy because I was successful even though it was my first time! I'll be making this again soon!!! Here's the recipe...you should try it! 1. 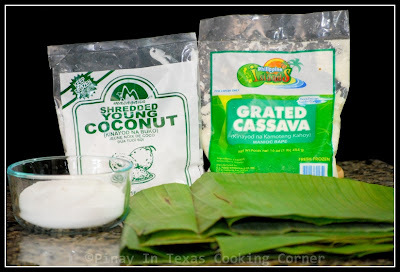 Drain cassava and shredded young coconut. 2. 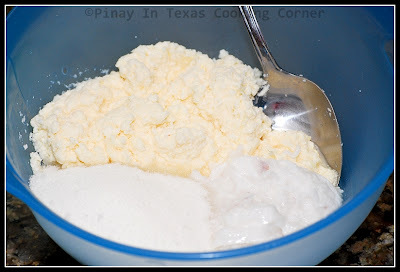 In a bowl, mix cassava, coconut and sugar until well combined. Set aside. 3. Clean the banana leaves by wiping with wet paper towel then with a dry one. Pass the banana leaves one by one over flame to make it easy to fold. We have a ceramic glass cooktop, so I just put each piece of leaf on top of it until soft but not burnt. 4. Lay a piece of banana leaf on a flat surface. Scoop about ¼ cup of the mixture on it. 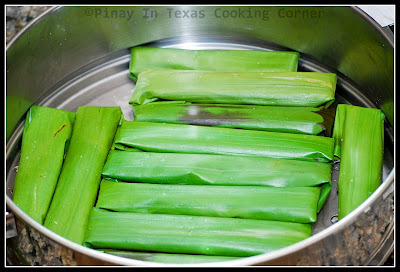 Wrap tightly to make each suman in the shape of a thin roll. Repeat this step until you have used all the mixture. 5. Arrange in steamer and steam for 35 minutes. 6. Remove from heat. Allow to cool down before serving. Don't forget to check out my 100th post giveaway. It will only be until July 12...so join now! Hey! Congrats on your 100th post! Hmm, I don't think I've seen frozen or ready-packed grated cassava here. I suppose if I used the fresh ones, I'd just have to grate them myself. Will it be the same? This looks delicious and I'm thinking of even having it with palm sugar. Yum! 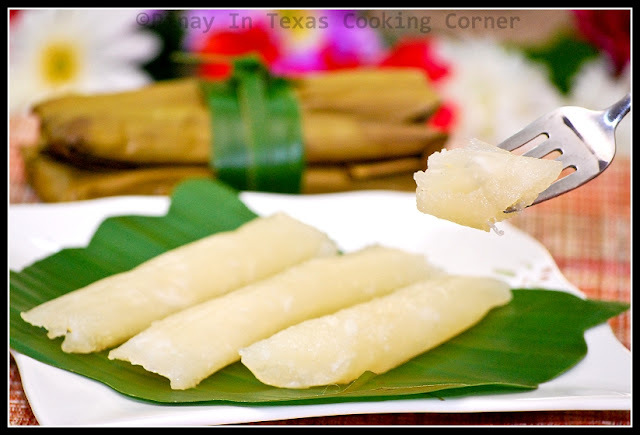 @Ping: My mom used to make cassava suman using grated fresh cassava. I guess it will be the same. Just be sure to squeeze it well after grating, and remove the fibers. Congratulations on your 100th post.My mom used to make this also.So yummy.. This is really good and I love cassava too. Congrats on your 100th post and more post to come!! Happy weekend! Congrats on your 100th post! The recipe sounds like a wonderful dessert! Wow Tina, congratulations on your 100th post and what a great post this is too! Here's to your next 100 - congratulations, love this blog! Congratulations on your 100th recipe post Tina! Great number to start on your 200th. Love Sumang Cassava. It's my lola's favorite pasalubong for us when I was growing up. Congratulations on your 100th post! Woohoo!! I'm going to check out the link for the giveaway now! Woo! That sounds awesome. I have frozen cassava in my freezer (but not shredded. I had no idea it came in that form). This looks so good. I love all the foods wrapped in leaves. They ALWAYS taste good that way it seems like, at least all the ones I've ever bought at a roadside stand (and I've had a lot of them). For fresh cassava, use juicier machines if you have one, of course it extracts the juice separately, no more draining and squeezing. .